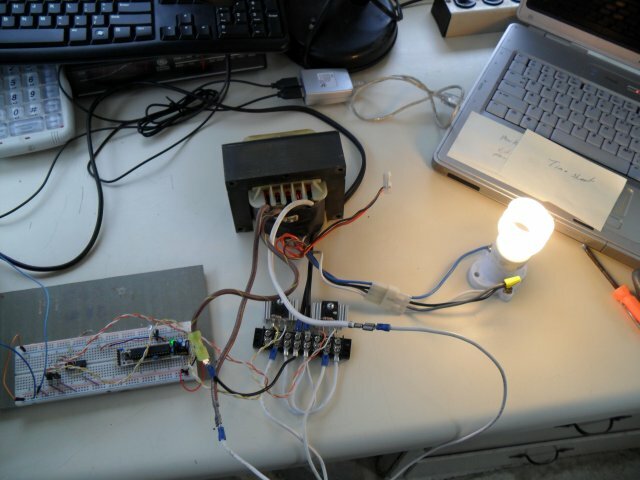 Arduino power inverter new version: Arduino Power Inverter Revisited. Arduino power inverter old version: Arduino Power inverter. In my college classes several of my students plan to study solar energy in particular how power inverters operate. This is a demonstration I setup for my class. Monitor the transistor heat sink assembly and turn on a cooling fan if too hot. Power up slowly to prevent huge current surges on the 12/24 volts source. Note: this does not output a sine wave. That would require far more complex circuitry to the point it's cheaper to buy an inverter. Second this outputs 50Hz or 60Hz depending on delays in the software. A commercial unit chops the DC at a high frequency. Then steps it up through a smaller transformer and rectifies and filters the high-frequency AC to DC. This is then chopped to 50Hz or 60Hz AC through a transistor circuit. This is done to reduce the size and cost of the transformer. The drive output from digital pins 9 and 10 provide two square waves 180 degrees out of phase. In a normal 60 Hz. the AC half-cycle period is about 8.33 milli-Sec. pulse width. The frequency and pulse width are very important in determining power output. This was very easy to control with the delay routines in the software. Both diagrams below were tested on a compact fluorescent lamp, a dual tube four-foot shop light, and a Black and Becker power drill. I also tested several transformer types while one transformer designed for a 400 watt uninterruptible power supply (UPS) provided best performance. See Wiki for more on a UPS. In fact this is a recreation of a UPS. I only tested these circuits at 12 volts. The output is a modified square wave. In figure 2 above we use a 24-volt center-tapped transformer and drive this with N-channel power MOSFETs. I have tried to use bipolar transistors but the performance and output was poor. I used surplus IRFP450s and IRFZ46N types. Both worked well and must be heat sinked. By switching one-half of the transformer side at a time, we recreate the negative/positive half-cycles on the AC output. If I used a 12 volt center-tapped transformer my output would be 240 volts. The 4N37 opto-isolators serve to isolate the micro-controller from the higher voltages and electrical noise of the output circuits. The MOSFETs can be simply paralleled source to source, drain to drain, and gate to gate for higher currents and power output. The 15k resistors are used to bleed the charges off the MOSFETs gates to turn the device off. In figure three I used my H-bridge circuit to drive a transformer. It works a little better than figure 2 and has the advantage of using a non-center-tapped transformer. It does use more power MOSFETs. The MOSFETs can still be wired in parallel as shown in figure 2 for greater power. This outputs two square wave pulses to drive inverter circuits using power MOSFETS driving a 24-volt CT transformer to output 120 volts AC. The period for a 60 Hertz sine wave is 16.666 mSec. So each half-cycle is about 8.3 mSec. The programs below puts out two square waves one for each half cycle, 180 degrees out of phase. This also has a soft start feature to limit power surges on power up. This also measure the voltage on the battery and disables output if the voltage drops below 10 volts. A 10k and 2.7k are in series and connected to the 12 volt battery bank or power supply (+ 12 connected to 10k) while one end of the 2.7k goes to ground. The 2.7k/10k junction goes to one of the Arduino ADCs and when the battery voltage drops below a half-volt (about 10 volts on the battery) is disabled until battery is recharged.